Brown Rice, Kidney Beans, Diced Fresh Tomato, Dice Ripe Haas Avocado = YUM! In a microwave safe bowl, add 1-2 cups of brown rice breaking up chunks. Place the bowl into the micro wave for 1:20 (one minute, twenty seconds) on high or until warm to the touch. While the Brown Rice is in the Microwave, chop 1/2 to 1 vine ripened local grown tomato and 1/2 a medium size, ripe, Haas avocado. For this recipe, I use canned kidney beans. Drain and Rinse kidney beans thoroughly. 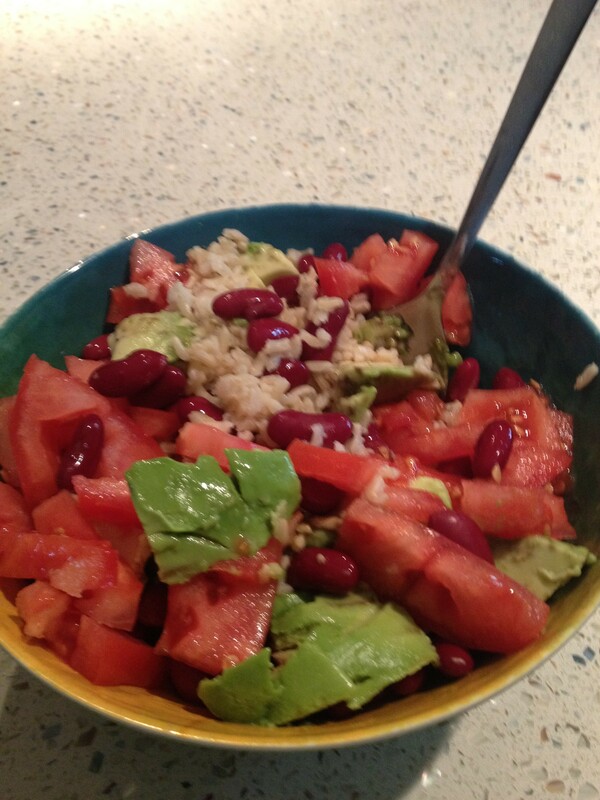 Add kidney beans, tomato and avocado to the bowl of warm brown rice and your ready to grind. That’s it! The combination of flavors is spectacular so there is no dressing or additives necessary. Try it and enjoy! This entry was posted in Recipes on January 8, 2014 by Jason Hennessey. Had this for lunch today. Added a little of The Pepper Plant Chunky Garlic Hot Pepper Sauce. So good, quick and easy.